I somehow missed getting this on my starting list, so I'll count my last visit Wednesday night, though of course I've been here many times before. While this is now a regular venue for punk bands, I remember when it was Tex's Tavern and they first started trying out having live music. The back stage area didn't exist then, and the bands played by the front window, and when they started up they immediately emptied the place of 3/4 of the patrons -- the old folks who at that time were the primary clientele. For an illustration of just what kind of place it was for the bands in those days, I remember a time the bartender interrupted the set of my brother Spud's band, because a patron wanted cigarettes and they had to unplug the amps to plug in the cigarette machine. That same night LeRoux gave a dressing down to a guy for sneaking drinks from her beer, and then refused to buy him a pitcher in exchange for his engagement ring. 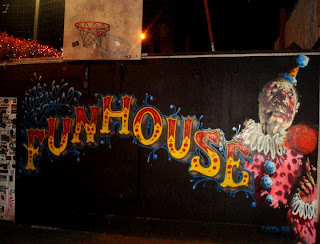 At any rate, the Funhouse is now a fine, dark alternative to the Disney-esque EMP and Seattle Center across the street, and the flickr search provides a pretty good sense of the place (and hence is not entirely work safe).